Longstone Classic tyres are one of the only companies to offer a proper classic tyre fitting service for free at our warehouse: Longstone Road, Hudson’s Yard, Bawtry, South Yorkshire DN10 6NX. 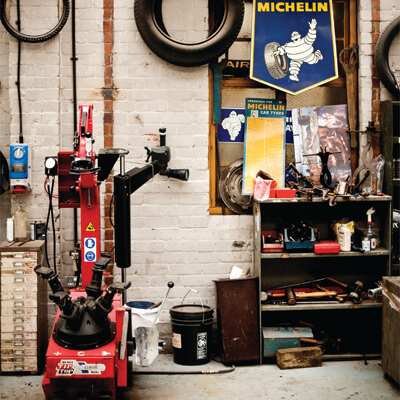 To take advantage of our service closer to your home, check out our Vintage Tyre fitting service. This also applies to classic tyre fitting. And balancing wheels on your classic car, which is especially important on wire or spoked wheels. Vintage beaded edge or clincher tyres. Vintage straight sided or split rim tyres. Vintage well based Crossply Tyres. Tyres on millimetric Bibendum rims. Classic Cross ply Tyres with or without inner tubes. Tall profile classic radial tyres with or without inner tubes. We fit classic tyres onto wire wheels. 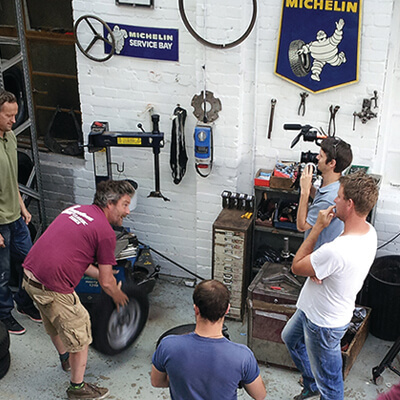 Fitting early low profile tyres. At Longstone through practice and an understanding of the way many of these unusual wheels are mounted on our Classic and vintage cars, we have carried on skills that could otherwise have been forgotten. The most useful would probably be the ability to balance Rudge Whitworth knock on wire wheels. Please pop by and take advantage of this service. Longstone Classic tyres also supports the Vintage Sports Car Club's speed events mounting classic tyres around the country, which we believe makes Longstone Classic tyres your only local Vintage tyre fitting service. For information about the events we attend please see the events calendar.